Pepperidge Farm once marketed its Goldfish crackers as a bar snack, but noticed later that moms were buying the crackers in spades for their children. 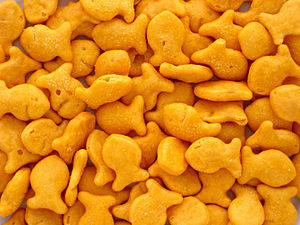 So Pepperidge Farm refocused the Goldfish brand on kids, even adding a smiley face. Ford launched the Edsel after much market research found the “best” designs for each auto component desired by consumers. However, when adding the favorite tail fin to the favorite hubcab, Ford ended up with a really ugly car, the Edsel launch bombed, and Ford went into rapid redesign mode. Decades later, Honda followed suit with an auto success, but also made a mistake. It originally marketed the boxy Honda Element to early 20somethings, with a wink-wink campaign talking about fully reclining seats and images of the tiny SUV parked on beaches by the ocean. But sales took off among dads in their 30s and early 40s who found the small SUV perfect for hauling kids. None of these stories may be true (although I keep hearing them); a little online investigation found that Pepperidge Farm has been selling Goldfish crackers since 1962, when founder Margaret Rudkin found the recipe on a trip to Switzerland, which doesn’t sound like the start of a bar marketing campaign. Still, the concept that marketers often miss their demo target by a mile and have to quickly adjust products or messaging is one we can all relate to. The lesson is we marketers are often likely to get our first campaigns right. The only question is, how fast can we react when we discover we’re wrong?